Invite pollinators to your garden this season by planting rattlesnake master, eryngo [Eryngium spp.). A member of the carrot family, rattlesnake master displays globe-like blossoms and spiny foliage. Adaptable to a variety of habitats and blooming in your choice of white, blue or purple in the summer, rattlesnake master attracts a variety of bees. Because the stems are slow to break down, they also make wonderful nesting sites for various wood-nesting bees. Hardy in zones 4-9, rattlesnake master can grow up to 4’ tall. If parsnips were planted in your vegetable garden last year, now is the time to dig them up for harvesting. If left in the garden, they will resume growing and lose their flavor. Remove winter protection from roses such as straw or other mulching material hilled up around the bulging grafts. Now is a great time to fertilize roses too! Fertilize pear and apple trees! A beautiful large shrub, or small shrub, for a moist and shady location is bottlebrush buckeye (Aesculus parviflora). Attracting a variety of pollinators with its showy, white flowers that appear in June and July, bottlebrush buckeye can reach heights of 8’-12’ and grow 8’ – 12’ wide. Hardy in zones 4-8. Hanging a few CD’s to spin in the wind on fruit trees helps deter birds and deer from browsing on buds and fruit. When making apply jelly or raspberry jam, add a sprig of lavender to each jar. Pale-colored flowers of clematis tend to become bleached in strong sunlight and are best suited for growing in shade or part shade. 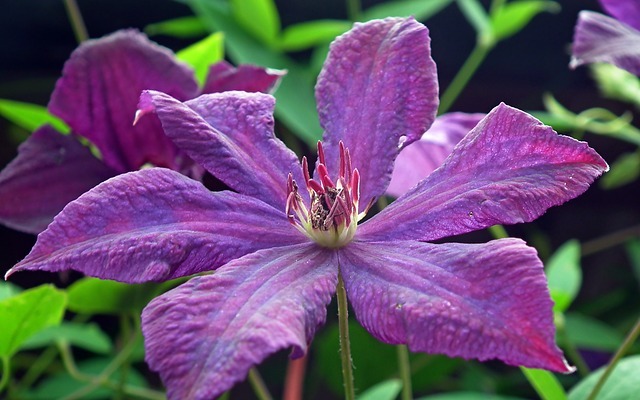 Large-flowered clematis require protection from wind damage and scented clematis perform best in sunny sites. The scented clematis also require regular watering due to their sunny location. Remove frost protection from strawberries as soon as the top few inches of ground have thawed.